People either love or hate Valentine’s Day, but one thing is inevitable: we all have to get through it. So whether you are in a committed relationship, married, dating or are single, we want you to thrive on February 14. That could mean taking your partner out, and making a commitment to spending quality time together more often. Or, it could mean spending the night with your friends and celebrating life and independence with them. If you’re not sure how to feel about Valentine’s Day, then we’ve got you covered. 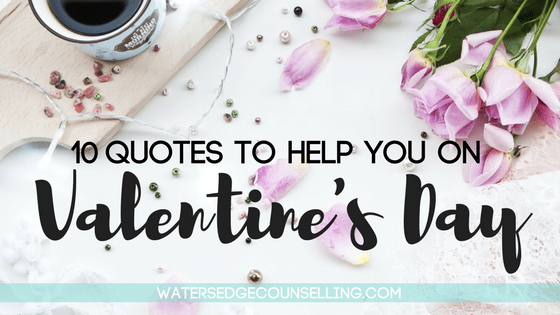 We’ve chosen 10 quotes that sum up the beauty of finding and maintaining love, as well what it means to truly love ourselves no matter what season of life we’re in. What are your plans for Valentine’s Day? Let us know in the comments below! Are you concerned about your relationship with your significant other or spouse? Are you single and want to become your best self? Here’s what you need to do: contact Colleen on 0434 337 245 or Duncan on 0434 331 243 for a FREE 10-minute phone consultation on how we can best help you, or press book now to book on our online diary.